Design studio To The Point have created 67 informative graphic panels that stretch across 70-metres, which is the circumference of the site of the future Pears Building. Graphic design is being utilised to get the local community excited about medical research. 4. A community section that includes illustrations, drawings and comments from the local community. 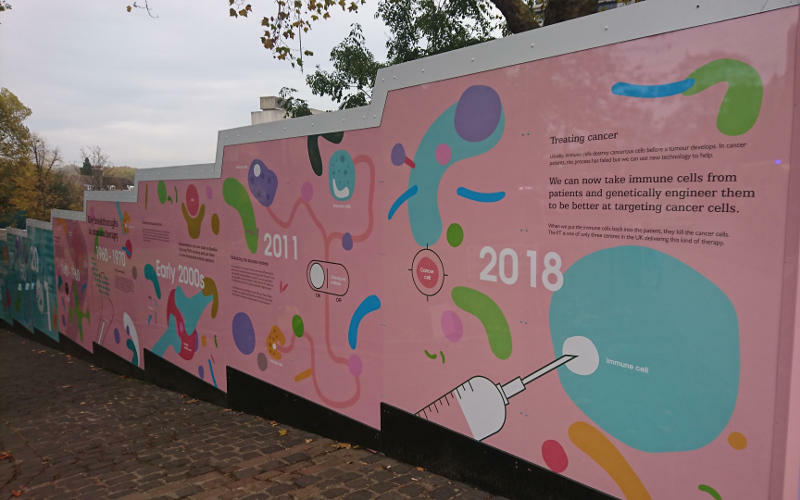 The colourful hoardings include photographs, text and illustrations to entice passers-by to stop and find out more about immunology research and the important work undertaken at the IIT. The hoardings also aim to encourage young people to take an interest and consider a career in scientific research. The Pears Building, which will be the home of the UCL Institute of Immunity and Transplantation (IIT) is a £42million immunology facility next to the Royal Free Hospital due to open in Autumn 2020.